Ruby Heart was once one of America’s elite athletes, an Olympic gold medalist who put the United States on top in middle-distance race competition after years of being shut out of the medals. The darling of press and public alike, Ruby liked winning. Her parents, her coach, and her agent liked her winning too; they were all heavily invested in seeing that she continued to do so. Conditioned to doing what her coach told her to do, Ruby obeyed when her coach told her to inject someone else’s blood into her body as insurance for continued wins. When the blood doping scandal broke, Ruby’s coach went to jail, and Ruby’s career crashed in flames that burned hotter and brighter than the Olympic torch. She was forced to return her Olympic medal, she lost her lucrative endorsements, and she was banned for life from competing in any form of running represented at the Olympic Games. Hounded by the press and despised by the public, Ruby retreated to her parents’ home, a prisoner of her disgrace. But five years have passed since her public humiliation, and Ruby Heart is ready to run again. At first, sportscaster Micah Blackwell can’t believe that the runner he spots at an ultramarathon he is covering for his network is really Ruby Heart. He hasn’t seen her since he humiliated her in an interview after the scandal and left her in no doubt about where an athlete who betrayed her gift, her sport, and the public trust fell in his estimation. A former star quarterback, Micah understands the competitive spirit and the desire to win. The late hit that ended his professional career and left him a paraplegic just redirected his ambition. Micah has his eye on an anchor chair, and a series focusing on the return of Ruby Heart could be just the plum that would win him that coveted place. Now all he has to do is persuade her to cooperate. Ruby knows Micah Blackwell is out of his mind if he thinks she is going to give him a second chance to humiliate her. She may not be as immune to his charm as she would like, but she is not foolish enough to say yes to his request. However, when her mother unleashes Micah’s rival on her, Ruby decides Micah is the lesser of the evils. As Micah and Ruby spend time together, they become friends. When the possibility of a more intimate relationship develops, Ruby has to decide how much she trusts Micah, and Micah has to decide if what he feels for Ruby is worth the conflict of interest that could destroy the career that has been the focus of his life. 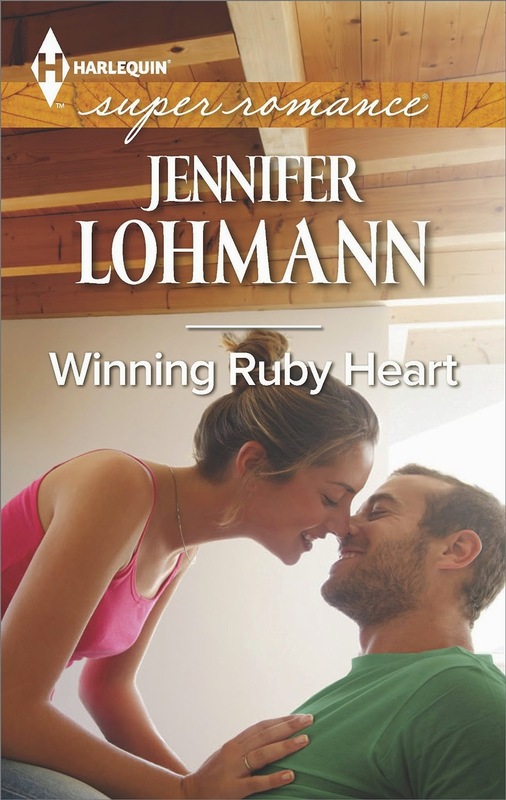 I gave Jennifer Lohmann’s The First Move high marks and enjoyed the other books in her Milek trilogy, so I was pleased when I received an advance copy of Winning Ruby Heart, particularly when I realized her heroine was an athlete. With the recent trend in romances featuring athletes, female athletes have been given surprisingly little attention. For these reasons, I was predisposed to like this book, and I was not disappointed in the major characters. Because much of Micah’s struggle occurs before the story opens, Ruby experiences the greater growth. It is refreshing to see her acknowledge her responsibility in what happened to her and refuse to play the blame game. The scene where she stands up to her controlling parents is a real cheer-out-loud moment. Despite their initial conflict, Ruby and Micah have a great deal in common. They both know what it is like to have no choice but to give up the sport to which they have devoted themselves, and they both know what it is like to be defined wholly by a piece of who they are. Micah knows this experience from two perspectives—first as a star athlete and later as a disabled man. Neither had an idyllic childhood, and they both have definite flaws. They are real and they are sympathetic, despite their weaknesses. And Lohmann brings her readers into the lives of these two people with a rare richness of detail and emotional complexity. Two things kept the book from being a five-star read for me. First, except for Micah’s father, Ruby’s Dalmatian Dotty (a heart-stealer for animal lovers), and, to a lesser degree, Ruby’s brother, all of the secondary characters lacked dimension. This was a particular problem with the villain because the impression of him as little more than a cardboard evil man increased through the high point of the action that felt more contrived than organic. Second, and this is a quality I often bemoan in categories, the ending felt too rushed to be fully credible or wholly satisfying. I badly wanted several more chapters that allowed the working out of problems and provided a more detailed HEA. Despite these complaints, I recommend Winning Ruby Heart. Ruby and Micah make the book worth reading, and I’m in favor of supporting authors who depart from the predictable. I finished the book glad that I read it and eager to see what Lohmann has in store for her readers next. Thanks, Janga! I love Harlequin's Superromance line and this one sounds like it's one I'd enjoy a lot. This sounds so good I can't wait to read it. Thanks for the review. I like the sound of this one. It addresses some issues in the sports world that deserve exploration. It is too bad there isn't space for more plot and character development.. but as you said, that is a problem with category romances. Thanks for the review.